It might be cold and miserable outside, but in the Teddy Bear Woods, the weather is always warm and cosy. 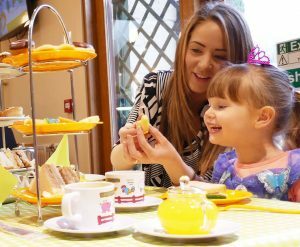 On weekday afternoons during January, February and March bring along your favourite teddy bear, doll, or any other soft toy, for a special woodland picnic in the tearoom at Almond Valley. Here there are games, camping adventures, and many interesting things to explore. Once the fun is done and the soft toys get sleepy, it’s time to tip-toe next door and indulge in a delicious afternoon tea. There’s a delightful array of sandwiches, savouries and temping cakes for the grown-ups, while the pre-schoolers get their very own tiered platter of dainty tasty nibbles. Afternoon tea costs £9.95 for Adults and £4.95 for children and must be booked in advance on 01506 414957. If you book afternoon tea you can enjoy free admission to the farm.